Mametja Moshe has over fourteen years finance experience in corporate finance, equities capital markets, debt capital markets, black economic empowerment, accounting, auditing and corporate tax fields. She is the founder and CEO of Moshe Capital. Prior to Moshe Capital, Mametja worked at Identity Capital Partners (“ICP”), a South African investment group, as an executive in finance and senior associate in the investments team. Mametja spent over four years in banking prior to ICP at: Morgan Stanley from 2007 to 2010 covering South African, Zambian and Nigerian M&A and equity capital markets and UBS South Africa (2006 to 2007) covering South African M&A. During this period in banking she led teams in the execution of transaction worth over $4 Billion. 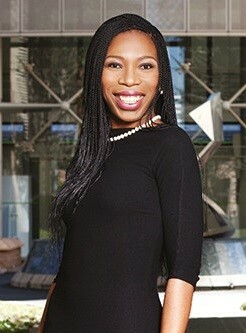 Before her investment-banking career, Mametja spent five years at KPMG Inc. serving her auditing articles in the consumer products team and later joining the corporate tax team where she covered tax compliance, restructurings, mergers and acquisitions and Black Economic Empowerment transactions. Mametja sat on the boards of Identity Mineral Resources (Pty) Ltd and Altech Netstar (Pty) Ltd (alternate), Southgold Exploration (Pty) Ltd, a subsidiary of the multinationally listed Great Basin Gold Limited and EuroDollar Foreign Exchange (Pty) Ltd.
Mametja obtained her B. Com Hons (Accounting); and B. Com Hons (Management Accounting) degrees from the University of Kwazulu Natal. She is a qualified chartered accountant and an MBA graduate in the Global Executive Program at Columbia Business School and London Business School.